Yesterday, the Aged Care Royal Commission started hearing the stories our aged care members have been telling us for far too long. We’re now getting ready to share your stories. In March, we will be surveying all our members who have worked in the aged care sector; those who have worked as personal care workers, in leisure and lifestyle, as cooks and chefs, and in administration, to understand your experiences working in the industry. We want to hear from you. Australia currently has about 2,800 residential aged care facilities providing care to more than 300,000 individuals, almost 8% of the Australian population (Australian Institute of Health and Welfare, 2016). Over the next ten years, the number of residents is projected to grow significantly and the highest area of growth will be among residents aged 95 or over. About 6.1 million Australians are aged over 55, but only 6.0% live in retirement villages or residential aged-care facilities (Aged Care Residential Services Market Research, 2016 & King et al., 2013). Australian Institute of Health and Welfare (2016) has estimated that around half of aged care residents suffer from dementia and that the number of people who develop the condition will increase from 220,000 currently, to as many as 400,000 by 2020 and between 730,000 and 900,000 by 2050. Notwithstanding, the diagnosis and treatment of dementia can be significantly improved, providing the sufferer with a better quality of life and their families with support. However, aged care staff are undertrained and under resourced to care for people suffering from debilitating conditions such as Alzheimer’s or Parkinson’s disease. Australia’s aged care sector is dominated by not-for-profit organisations (58% in residential and 81% in home care). However, over the last decade or so, we have seen an increasing number of for-profit providers enter the aged care market. The aged care sector has also seen a large number of mergers occur within the last decade or so, resulting in larger providers with substantial facilities. Over the five years through 2015-16, Australia’s aged care industry revenue is expected to grow at 4.5% annually and to reach $18.3 billion. In 2015-16, industry revenue is projected to increase by 4.7% (Aged Care Residential Services Market Research, 2016 & King et al., 2013). The Australian aged care sector is projected to be the fifth largest employer and is one of the largest growing service industries in Australia (Australian Bureau of Statistics, 2013b). In the next 30 years Australia will see an unprecedented rate of growth of the over 85s in our nation. In 2044 there will be 1.2 million more people aged over 85 than there are today, and the average older Australian will live 5 years longer than today which equates to adding 6 million more years of care just for the increased number of over 85s and just to manage their increased life expectancy. The Australian Institute of Health and Welfare (2014) and the Productivity Commission (2011b) found that Australia’s aged care sector is beset by multiple problems and requires significant changes to deal with future challenges associated with an ageing population. Government and sector responses to these difficulties have involved various recruitment, retention and productivity responses and fragmented funding for staffing innovations and training. However, proposed funding of wage increases have been met with significant resistance by employers and government, resulting in a significant wage gap. 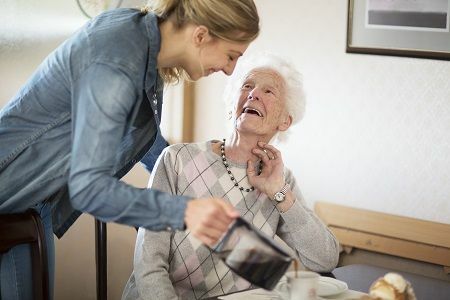 To make matters worse, many employers have substantially influenced the de-skilling of the aged care workforce-the highest qualifications that care workers hold are the Certificate III and IV in Aged Care/Home and Community Care. Aged care providers have reduced the number of registered and enrolled nurses within their residential aged care facilities. As a consequence, Personal care workers account for almost 68% of the aged care workforce. The care workers have been forced to take on the roles of Nurses (Enrolled and Registered). We are concerned that care workers have been asked and some cases forced to administer medications, such as psychotropic medication and antipsychotics, insulin and so on to aged care patients. Unfortunately, changes to the law allow aged care providers to make aged care workers to dispense mediation to patients. In numerous submissions to the senate, parliamentary inquiries and the Victorian Department of Health, the HWU has lobbied for change and argued that care workers are not adequately supervised or given the opportunity to attain higher qualifications so that they can do the more complex job roles that have been added to their Position Descriptions over the last decade or so. 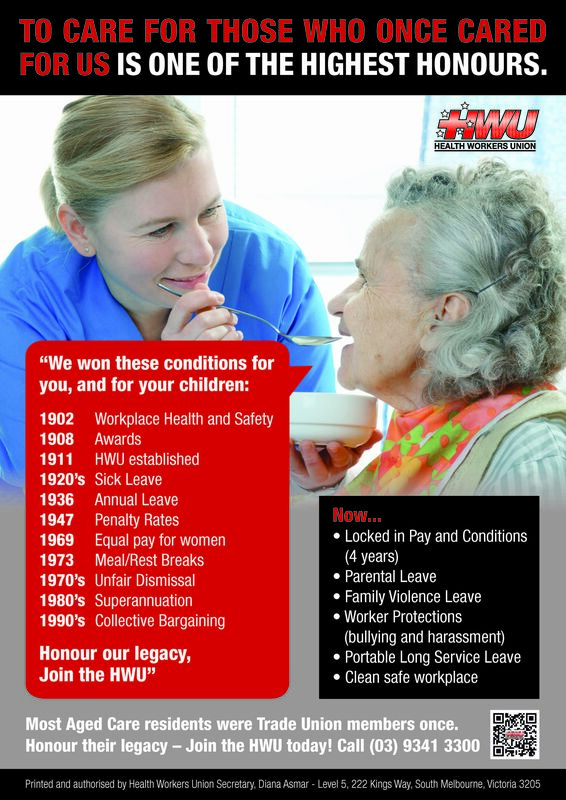 Please feel free to download the HWU Aged Care poster and place it on your notice board at your worksite. With so much that needs to be done to improve the aged care sector, the HWU has been busy representing our aged care members in multiple areas. We have been lobbying the Victorian government to make aged care facilities safer and to invest more money into the sector- to increase care worker pay and work conditions and to introduce Care worker to Patient ratios within our residential aged care facilities. Our Research Officer, Kamal Bekhazi, has been busy making multiple submissions to the Federal and Victorian government and to the Department of Human Services in an effort to improve our aged care sector and achieve better outcomes for our aged care members. Most recently, the HWU made a quality submission to the Federal Senate Inquiry into Australia’s aged care workforce and was asked to appear before the Senate inquiry (May 2016) to inform the senators of our plans to improve the aged care sector. The Federal Senate inquiry into Australia’s Aged Care Sector decided to hold their first Public hearing in Melbourne and invited our Assistant Secretary, David Eden and our Research Officer, Kamal Bekhazi, to be the first witnesses to participate in the inquiry. The federal government must develop a Workforce Development and Transitional Working Group whose initial role would involve the establishment and implement of an Aged Care Workforce Development Plan. 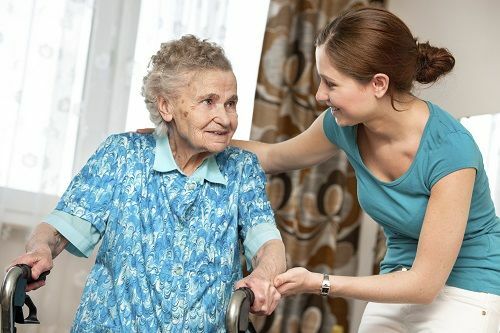 Given that aged care workers have been asked to administer medications without the appropriate qualifications, aged care workers must be encouraged and supported by management to acquire new skills via the completion of skill sets and Diploma and higher qualifications (these qualifications must be created because they do not exist at present). We recommend mandatory minimum Resident to Care Worker ratios within public, private and Not for Profit residential aged care facilities. For aged care employers to respect current Occupational Health and Safety laws and to make their workplaces safer by enforcing existing guidelines. That the government invests in a multidisciplinary team within the aged care facilities and not expect care workers to take on the roles and responsibilities of Doctors, Registered and enrolled Nurses, Allied Health and other professionals.